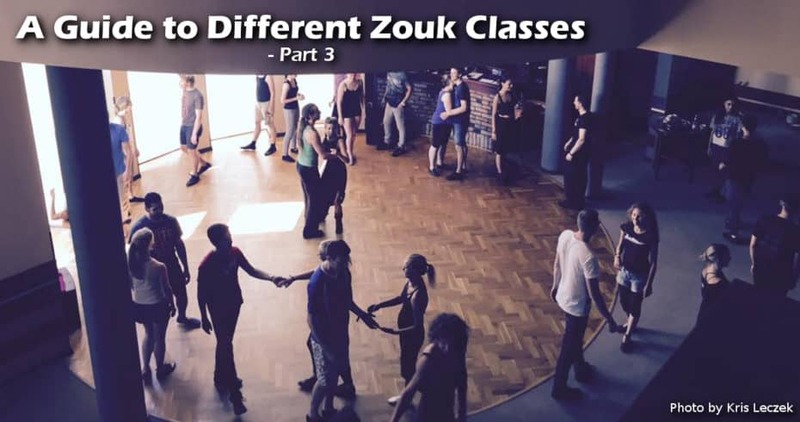 This is part 3 of 4 of ‘A Guide to Different Types of Zouk Classes’. Click here to start with part 1 if you’ve not read it yet. My Definition: Come when you want, stop when you want. These are classes you will find teaching in bars typically by Zouk enthusiasts and will have social dance hours after classes. There tend to be 3-4 different levels; Beginners, Improvers (sometimes), Intermediate, Advanced. Taught by: Typically Zouk enthusiasts but you may get professional guest teachers on special occasions. Who is this suitable for? First timers and hobbyists who just want to learn a few moves. Who this NOT suitable for? Anyone who’s serious about learning how to dance Zouk. Speed of progression: Low with early plateaus. Discipline & commitment required: Very little, whenever you are free. My comments: Predominately based on teaching movement patterns. These are great for people who have never danced before and would like to sample what it could be like to social dance. A main reason for the early plateaus is because most classes that I’ve experienced seems to teach a completely new set of movement patterns every week. Dance progression comes from the regular repetition of applying a variation of the same techniques into very simple movements. By radically teaching different movements with little explanation of techniques at every class is not an effective method for reinforcing any forms of memory or educating how to dance. Bar classes have always been a popular and well-utilised marketing tool to raise awareness of Zouk and bring new dancers into the community. However, they can draw in crowds where the people come more to relax and socialise after work than to learn how to dance. But then this class structure and environment do fit well with their reasons for being there. My greatest concerns were with the intermediate and advanced drop-in bar classes because most of the students were trying to learn something way beyond their ability and really needed to go back to basics. In my opinion, not only does this stop their own progression, but it also selfishly impacts others. When the follower doesn’t know the basic movements she has to watch the teacher rather than feel the leading so the leader is never going to learn how to lead the movement correctly as the follower just automatically does the steps without waiting for the leading. Also, none of the followers at these classes are able to hold themselves even when walking in a line, they press their own weight and expected me to hold them up or keep them balanced. Therefore I would take the levels offered at these classes with a pinch of salt as they rarely reflect a student’s true ability or progression, but serve more like a feel-good factor for the students. I do understand levels are difficult to monitor and control, due to the inconsistency of new dancers joining and leaving each week, and many people attend bar classes just to relax after work, to socialise and have fun and aren’t particularly interested in becoming advanced technical dancers. But at the same time, Zouk can be a physically challenging and potentially dangerous dance form and for everyone’s health & safety and continued enjoyment, there are movements that should be taught or attempted by qualified professionals who understand the ramifications of exactly what they are teaching. For example – does any bar class teach weight transfer techniques, or how to control your own body or what skills are needed to become a light follow or a gentle leader? I haven’t seen this. From what I’ve witnessed over the years, having this multi-tier level system of beginners, improvers, intermediate, advanced, master classes etc only creates segregation and feeds egoism. There seem to be a lot of people who don’t like being stuck in one level for long periods of time or being told to stay in “Beginners”, and feel that they are better than what they really are. This overconfidence in their lack of skills is very dangerous on the social dance floor. Rather than having a multi-tier level system that seems to feed egoism, there should just be a “Zouk Foundations Class”. That’s it! Only one level that you need to give you the skills to learn how to dance broken down into topics, techniques, and concepts. Having recently spoken to Willem Engel (the renowned teacher of teachers from the Netherlands) at the Masterclass & Teachers Course event, we had a discussion on some of the above issues and how this multi-tier level system will continue creating problems as the Zouk scene grows. This conversation has helped re-enforce how I feel about this multi-tier level system that is often used throughout the world, a system that’s failing students. Drop-in classes, especially in public places like clubs, bars or restaurants, are excellent to draw in new people, but only for that. It’s a taster and first step. When people get hooked, even if it is just for movement patterns, they should be taken to a proper danceschool (location&teaching wise) for regular classes. Also for them to realize, it is fun, but now they need to practice, learn and work on there dance. For me, to put levels for drop-in classes, doesn’t make sense at all and as described leads to a big variety of confusions and illusions. To be honest, i hesitate even to use levels to label regular classes. For me the people have levels and individual progressions. The classes have topics. Agreed Eric! Unless the teachers plan to strictly re-enforce how students are promoted / demoted in a multi-tier level system, I don’t see the point of having these in drop-in classes. Brazilian Zouk, or “Zouk” as it is more commonly known, is a fun, dynamic and modern partner dance originating from Brazil. Zouk is most recognised for its mesmerising fluidity & flowing head movements and can be danced to a variety of musical genres including classical, pop, dubstep, hip hop, R&B and lyrical.